Leaves of three! Poison ivy is growing very rapidly with all this rain. This is the time of year when I see evidence of gardening injuries among my friends and colleagues. One gardener I know broke her wrist and asked the doctor for a Gore-Tex cast so that she could wash the soil off after gardening. I once asked a visiting garden club from Virginia how many of them had ever been treated for Lyme disease and to my surprise every one of the 38 women raised their hands. Last summer I watched my neighbor hobble around his garden with his leg in a boot. He broke it after a fall – he was pruning from a ladder at the time. One gardener I knew in Virginia insisted on gardening with a patch over his eye – I really enjoyed giving him the nickname the “pirate gardener” (I think he enjoyed it too). These are hard-core gardeners, they are the kind of gardeners who are happy to go to plants sales in a downpour or to wake up at dawn on a Saturday to get outside. You know who you are! I support this enthusiasm, but would like to temper it with a reminder to protect yourself. The basics of ‘PPE’ are pretty simple – PPE is short in our industry for ‘Personal Protective Equipment’ and includes recommendations for proper equipment you’d use for spraying pesticides and for using power equipment. When I say ‘simple’ just think of it this way, you ought to wear hearing protection, gloves, and eye protection whenever there is a risk of injury. You should also follow the label of any chemical you are applying and its recommendations for protective clothing. Put another way, if you have to raise your voice to be heard you should be wearing hearing protection; if something can get in your eye or strike your eyeball, you should be wearing eye protection; and use situation-specific gloves whenever there is risk of blisters or abrasion. It is all pretty common sense and you probably already do this to some extent. Here are some additional things I have learned over time. I spray my boots and gardening pants with Permethrin. Once the spray has dried it will last for a couple of washes and it is an effective deterrent to ticks. I use Picaridin on my skin to repel mosquitoes and ticks – I don’t use DEET any longer – that’s my personal preference. If you wear light colored clothing it is easier to see the ticks crawling on you. For cuts and blisters I use lanolin and band aids. If you buy the pharmaceutical grade lanolin that is sold in the maternity/baby section of the drugstore you can use it over bad blisters or cuts and it makes an almost waterproof barrier. Add a band aid and you are all set to get back to gardening. I have a bucket of different kinds of gloves such as rubber coated cloth gloves and leather gloves that I am constantly rummaging through to find the right glove for the job. For cleaning up after gardening I use surgical scrub brushes and old-fashioned bar soap. You can scratch the soap with your fingernails and then scrub with a surgical brush to get rid of your green fingernails. I mentioned hearing protection above but it is worth re-emphasizing. You will almost always see our garden staff at Winterthur wearing hearing protection, even when they are just driving their utility vehicles, because there is a growing awareness of the cumulative damage that noise can cause to your hearing. The earplug-type protection is easy to carry, and so they have the convenience factor going for them, but I find that people often don’t use them correctly. Personally, I like the earmuff type of protection because it is much easier to get it right and be properly protected. I have the kind I can plug my iPod into and can listen to music while I am mowing, string trimming, or using a leaf blower. I am not allergic to poison ivy but I really don’t want to develop the allergy, so I am careful about handling the plants. Yes, I do hand-pull poison ivy seedlings in my garden. Here is my process in a nutshell. I wear disposable gloves, I put several plastic bags out before I start, I have soap (like Dawn liquid) and cold water setup so I can wash, and I also set up my shower so that I can rinse off without touching too many surfaces when I am done. 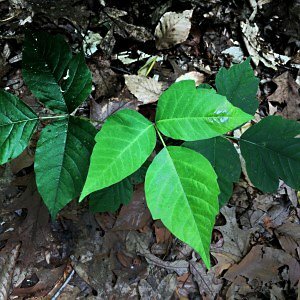 The active ingredient in poison ivy is an oil called urushiol. Chemically, urushiol is a hapten, a molecule that only causes an allergic reaction after it is bound to the proteins in our skin. This means that if you wash the oil away, you eliminate the potential allergic reaction. Cold water and soap are effective at washing away urushiol, but you can also use more powerful commercial products like Tecnu. I double bag the pulled up poison ivy after I have pulled it and I am cleaning up. Then I carefully remove the gloves I’ve used and throw those away too. I kick off my shoes and wash them with car wash detergent and cold water. I wash my clothes in cold water with detergent and I double rinse them to try ensure I leave no traces of urushiol in the washer. With the right planning, and if you are careful about secondary exposure to poison ivy, you can minimize your chances of an exposure that will result in a rash. These are just a few of the steps I take to minimize my gardening down time. I am sure you have your own tricks and insights. If you do, please include them in a comment and I would be happy to share them. Happy gardening!